What ages do you teach?? We teach all ages from 5+ – If your child is a bit younger we can book them in for a one-off trial lesson and let the tutor judge if they’re ready. We need to take things into consideration like attention span, hand size, communication skills and basic numeracy/literacy understanding. If your child has special needs, just let us know apon enrolment and we will endeavour to find a suitable tutor for them. We can offer different approaches to learning for different needs. What timeslots are available, and how long are lessons?? All of our lessons are 1/2 hr, and you can book an hour timeslot if you wish. The bulk of our lessons commence between 3:00pm – 8:00pm Monday through Thursday. However we do have a few tutors available for earlier lessons during the day. Just give us a call and we can let you know what times are currently available for your instrument. Do I have to wait for a new term to enrol?? No, you can enrol at anytime. Your lessons will be planned specifically for your current ability, and your term goes from there! Do you offer group lessons?? We do offer 2 on 1 lessons for siblings or family members that have the same ability level. Give us a call to see if there are currently any other larger groups running. How do I pay for lessons?? School terms are paid either in full or weekly payments can be setup through our Direct Debit system. Term payments can be accepted in cash, cheque, bank deposit or credit card. If you enrol halfway through the term, you only need to pay the remainder of that term. What do I need for lessons?? You’ll need a folder with sleeves to hold your music, homework and tutor notes. You’ll need your own instrument to practise on at home. How much practice should be done between lessons?? Younger students (5yrs – 8yrs) need more exposure to their instrument to keep in a routine and to keep the information fresh. Small doses of practise each day is beneficial for younger students, and should be encouraged by parents. At least 10 mins per day is a benchmark. As students get older and more proficient at their instrument, their daily practice amount should naturally increase. However “Quality” practice is better than just “Quantity” of practice. Students should have a specific goal in mind when practicing and focus on bettering that one thing. How do I get the most out of lessons?? Really listen to your tutor – get involved in your learning and ask any question you feel you’re unsure about. Practice exactly what your tutor suggests between lessons. Keep up to date with newsletters and school events. If you’re a parent of a child having lessons – come in and get feedback off the tutor. 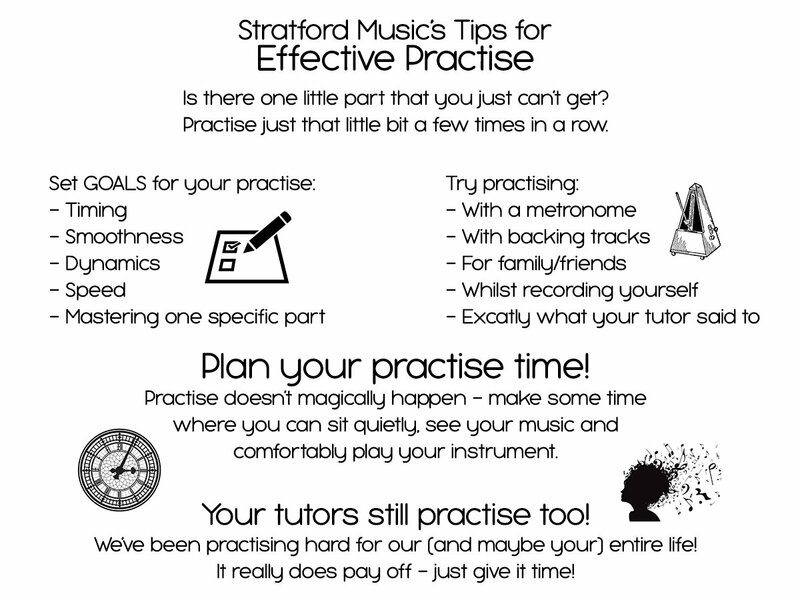 Check what the student should be practicing and what their goals are. Encourage your child to show you what they’ve learned. What happens in the holidays?? If you would like holiday lessons, just enquire at the front desk and see what’s available. Otherwise all Direct Debit payments are on hold until the new term starts. We’ll often have events scheduled in the holidays that you can take part in. ALL TIMESLOTS ARE HELD during the holidays so that you keep you tutor and time from term to term. If you’re not returning for the following term you MUST notify us so we can officially unenrol you. 48hr cancellation policy still applies. What if I can't make a lesson one week?? All we require is 48hrs notice and we can schedule a makeup lesson or apply a credit to your account. Without 48hrs notice the lesson time will be lost as tutors & rooms are booked in advance. What happens if I cancel lessons?? If at any time you need to cancel lessons, we can stop Direct Debit payments from occuring, or refund you the remainder of the term as long as it’s 48hrs before the next lesson.